Redbox is offering $1.50 off Movie or Video Game Rental when you use the promo code RL6MFYH5 Valid at Redbox.com, within the Redbox app or possibly at the kiosk. Today ONLY (April 18th). This code makes a DVD rental $0.25, a Blu-ray rental $0.50 and a game rental only $1.50. 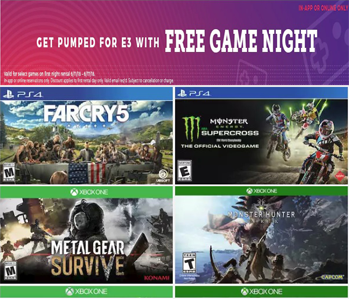 Get a FREE 1 Night Redbox Video Game Rental – enter promo code: BTNGREEN or BTNMINN to get a Free 1 night Redbox Video Game Rental. *This offer is still available in case you may have missed this! 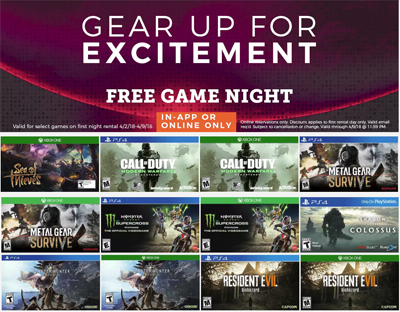 Get a FREE Redbox Video Game Rental! text GAMES to 727272! You can redeem the code at the kiosk, on the app, or on Redbox.com. Your code will be valid for one week! Note: This offer is still available if you missed it. To get a FREE Redbox 1-Night Blu-ray, DVD or Game Rental Text VALPAK to 727272 They will reply with a code. Expires 2/28/19. To get a FREE Redbox DVD Rental enter your email and then confirm via email and they’ll then email you a free rental code! Valid for New sign ups only. Redbox is offering a One-Night DVD Rental, Blu-ray Rental or Game Rental for just 16¢! Use enter the promo codes listed below. Valid Today, November 26th only. Note that there is a limit of one code per transaction. Get a FREE 1-night Redbox Blu ray or DVD Rental! Text code Night to 727272 they will reply with a code for FREE 1-night Blu ray or DVD rental. The code will also take $2 off Video Game Rental. Valid Today (October 28th) Only! To get a FREE Redbox DVD Rental add a DVD to your cart and enter coupon code J7YXYCUQ at checkout! Valid today only. 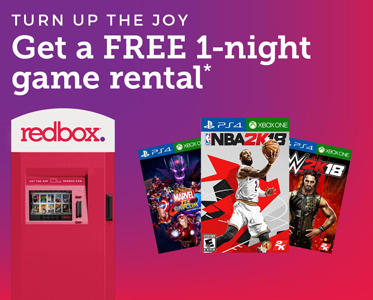 Through June 17th, Redbox is offering a FREE One Night Video Game Rental when you checkout online or in the Redbox app – no promo code is needed the discount is automatically applied during checkout. Redbox is offering a FREE One-night Video Game Rental! – Enter promo code 29LNF82784 at checkout. In-app or online only. Expires May 31, 2018.